Fresh from Claire Kilroy’s humorous fictional look at the Irish financial crisis, The Devil I Know came Donal Ryan’s The Spinning Heart. The Devil I Know is a lively interpretation of financial malfeasance and the subsequent Irish housing boom, and while I enjoyed the novel, I was a little troubled by its take the forces behind the irresponsibility. The Spinning Heart’s focus is on the fallout from the collapse of one dodgy contractor, Pokey Burke–a man whose name alone should stain the houses he’s built. But now the economy has collapsed, Pokey has buggered off to somewhere in Europe, leaving behind angry unpaid employees and unfinished houses. Even the ‘finished’ houses are falling apart. So this then is a ground-eye view of the average Irish man and woman touched, in one way or another, by Pokey’s actions in this novel told through 21 connected voices–all residents of one village. 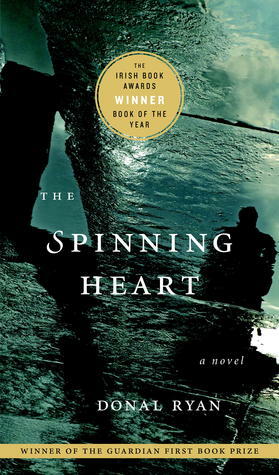 The first voice is that of Bobby, a son who hates his father, a man living in a cottage fronted by a gate which includes the spinning heart of the title. While the spinning heart is a literal element in the life of Bobby Mahon and his father, it’s also figurative. The metal heart is rusted and neglected, and it’s symbolic of the emotional states of many of the characters here who lead lives of bitter disappointment with parenthood, love and trust often ill-afforded curses in this harsh world. Bobby, who worked as Pokey Burke’s foreman, opens the story dramatically with a statement that lets us know just where he stands with his father. Bobby goes “every day to see [if] he is dead and every day he lets me down.” Bobby stands to inherit the cottage and the two acres left from drinking away the proceeds from “Granddad’s farm.” Bobby’s father, who’s never drank before in his life, inherited and then self-destructively “drank out the farm to spite his father.” Bobby is convinced that his father stays alive to “spite” him, and there’s definitely that element at play between father and son, and the cyclical dynamic of hate, spite and delayed revenge. Bobby’s tale also introduces the character of shifty contractor, Pokey Burke, a man who’s shafted his employees by withholding taxes and keeping the money, but at least Pokey’s Irish employees were paid–even if they were ripped off. Pokey never paid his immigrant sub-contract workers, and now Pokey’s angry, cheated employees can’t find him–he’s “sunning himself in only god only knows where, hiding from the bank and the taxman.” The Pokeys of this world always manage to slide through. Many voices in the book suffer in various ways from Pokey contagion. Pokey’s father, Josie, who’s deeply ashamed of his son’s actions asks in a continuation of the toxicity of parent-child relationships: “who’s to blame when a child turns out rotten?” Another voice belongs to Brian, a construction worker who’s decided to chuck it all and try his chances in Australia. So I’m going to Australia in the context of a severe recession, and therefore I am not a yahoo or a waster, but a tragic figure, a modern incarnation of the poor tenant farmer, laid low by famine, cast from his smallholding by the Gombeen Man, forced to choose between the coffin ship and the grave. While most of the characters are emotionally stunted human beings, Lily the local “wanton,” never refuses a man as a lover unless they “really and truly disgusted” her. Lily’s generosity of body extends to the generosity of her heart and she alone seems to be capable of emitting uncomplicated love–although that uncomplicated love boomerangs back with painful personal and social ramifications. While the novel is well constructed with one voice picking up the narrative from another angle and at a different place in time some of the voices are not as convincing as others. Vasya, “the Russian,” immigrant worker, for example, struck a discordant note for this reader with his description of his origins, “my mother’s mother spoke that way, in a dialect of a tribe of reindeer herders from far North of my family’s ground.” I almost gave up at that point, but I didn’t and I’m glad I persisted. Other voices are much stronger. Single mother Réaltin, for example, lives with her son in a house built by Pokey Burke. The house was bought by Réaltin’s father and it’s in one of the many ‘ghost’ estates–dozens of unfinished houses stand in various states of repair. Réaltin’s father cuts the grass of every house on his daughter’s street in an attempt to create a feeling and look of normalcy. Labourer Seanie Shaper, “a pure solid madman for women,” thinks he is the father of Réaltin’s son, Dylan, and rather poignantly and pointlessly attempts to carve a place for himself in Réaltin and his son’s lives. He took on a rake of Polish subbies and screwed the poor pricks and we all thought it was a laugh. The whole subbie thing was a right con job. Then he screw the rest of us and we laughed on the other side of our faces. Thanks to Kevin for reviewing this book and getting my interest. Like Kevin, I liked the book’s structure even though some of the voices were much less convincing than others (the child, the dead man, the Russian), and the brevity of those narratives undermined character development–although I could also argue that character development was not the point as the novel is a glimpse of a segment of Irish society in the aftershocks of the financial crisis. Another weakness of the novel was the distracting, implausible dramatic event that occurs and distracts from, rather than adds to, the narratives. Coincidentally I am currently reading another novel with multiple narratives but its focus on the actions of one woman allow a creative, multi-faceted approach to character that works very well indeed. I have been looking out for this but the quotes you high-lit have made me less eager to find it. Is the “going to Australia” voice an ironic quote or supposed to be the genuine voice/thoughts of a character? These are the inner thoughts as he’s explaining (convincing himself) his decision. There’s a touch of irony there, I think, but he seems to feel that having to leave the country makes him part of yet another diaspora–this one thanks to the housing crisis. The danger with writing a book with so many voices is that some may seem silly, fall flat, or be, as you noted unconvincing. The character of Lily as you describe her sounds different by transcending stereotype and therefore very interesting. I think it could work if all the voices are centered on an event (let’s say for argument’s sake, a natural disaster) or a single character all the voices knew. Initially the voices here centre on the collapse of the housing boom, but then there’s a shift to another incident which I though (IMO) brought the book down. Like you, I thought that the author lost focus when he introduced the diverting incident. Having said that, I do think he succeeded in portraying realistic responses from a variety of essentially powerless people who had to deal with an event (the economic collapse) that was entirely outside their control. Reading about the crisis in Ireland here reminded me of a novella I enjoyed very much last year, which dealt with the same subject with appropriately Swiftian exuberance – Julian Gough’s Crash! It’s a Kindle Single, and well worth reading. I actually think those multiple voices are what would work for me best. These days I like unusual structures but it shouldn’t be gimmicky. I’ve seen on of these ghost towns in Ireland, it’s chilling. The whole system was rotten because the insurance net that’s coming with new constructions (they’re supposed to bring the money to finish the houses) didn’t work either.